Pope Clement XII (Latin: Clemens XII; 7 April 1652 – 6 February 1740), born Lorenzo Corsini, was Pope from 12 July 1730 to his death in 1740. Clement presided over the growth of a surplus in the papal finances. He thus became known for building the new façade of the Basilica di San Giovanni in Laterano, beginning construction of the Trevi Fountain, and the purchase of Cardinal Alessandro Albani's collection of antiquities for the papal gallery. In his 1738 bull In eminenti apostolatus, he provides the first condemnation of Freemasonry, helping bring about the Catholic Church's longstanding opposition to the order. Lorenzo Corsini was born in Florence in 1652 as the son of Bartolomeo Corsini, Marquis of Casigliano and his wife Elisabetta Strozzi, the sister of the Duke of Bagnuolo. Both of his parents belonged to the old Florentine nobility. He was a distant relative of Saint Andrea Corsini. Corsini studied at the Jesuit Collegio Romano in Rome and also at the University of Pisa where he earned a doctorate in both civil law and canon law. Corsini practiced law under the able direction of his uncle, Cardinal Neri Corsini. After the death of his uncle and his father, in 1685, Corsini, now thirty-three, would have become head of the Corsini. Instead he resigned his right of primogeniture and from Pope Innocent XI (1676–89) he purchased, according to the custom of the time, for 30,000 scudi, a position of prelatial rank and devoted his wealth and leisure to the enlargement of the library bequeathed to him by his uncle. Corsini’s home on the Piazza Novona, was the center of Rome’s scholarly and artistic life. In 1690 he was made titular Archbishop of Nicomedia and chosen nuncio to Vienna. He did not proceed to the imperial court, because Leopold I, the Holy Roman Emperor, maintained that he had the right to select the nuncio from a list of three names furnished by the pope. In 1696, Corsini was appointed treasurer-general and governor of the Castel Sant'Angelo. His good fortune increased during the pontificate of Pope Clement XI (1700–21), who employed his talents as a courtier and named Cardinal-Priest of Santa Susanna on 17 May 1706, retaining his services as papal treasurer. 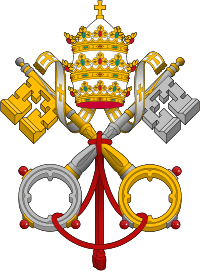 He advanced still further under Pope Benedict XIII (1724-30), who made him Prefect of the Apostolic Signatura, a judicial branch of the Roman Curia. He was successively appointed as the Cardinal-Priest of San Pietro in Vincoli and Cardinal-Bishop of Frascati. 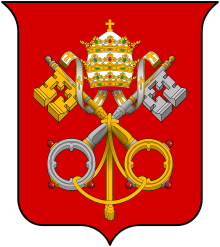 Under Benedict XIII, the finances of the Papal States had been delivered into the hands of Cardinal Niccolò Coscia and other members of the curia, who had drained the financial resources of the see. Benedict died in 1830, and in the conclave that followed his death, after deliberating for four months, the College of Cardinals selected Corsini, 78 years old and with failing eyesight, who had held all the important offices of the Roman Curia. Clement XII was one of the oldest men to be elected pope. As a Corsini, with his mother a Strozzi, the new pope represented a family in the highest level of Florentine society, with a cardinal in every generation for the previous hundred years. 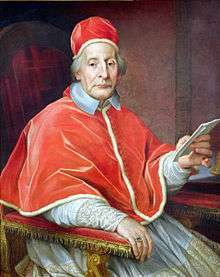 His first moves as Pope Clement XII were to restore the papal finances. He demanded restitution from the ministers who had abused the confidence of his predecessor. 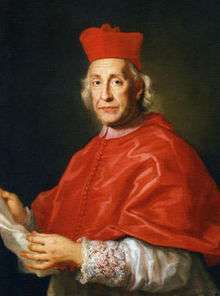 The chief culprit, Cardinal Niccolò Coscia, was heavily fined and sentenced to ten years' imprisonment. Papal finances were also improved through reviving the public lottery, which had been suppressed by the severe morality of Benedict XIII. Soon it poured into Clement XII's treasury an annual sum amounting to nearly a half million scudi, enabling him to undertake the extensive building programs for which he is chiefly remembered, but which he was never able to see. A competition for the majestic façade of the San Giovanni in Laterano was won by architect Alessandro Galilei. The façade he designed is perhaps more palatial than ecclesiastic, and was finished by 1735. Clement XII erected in that ancient basilica a magnificent chapel dedicated to his 14th century kinsman, St. Andrew Corsini. He restored the Arch of Constantine and built the governmental palace of the Consulta on the Quirinal. He purchased from Cardinal Alessandro Albani for 60,000 scudi a famous collection of statues, inscriptions, etc., and added it to the gallery of the Capitol. He paved the streets of Rome and the roads leading from the city, and widened the Corso. He began the triumphant Baroque Fontana di Trevi, one of the noted ornaments of Rome. Under his reign a port was built at Ancona, with a highway that gave easy access to the interior. He drained the malarial marshes of the Chiana near Lake Trasimeno. 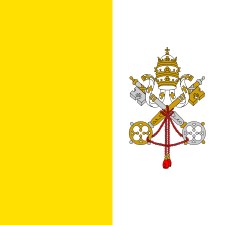 Politically, however, this was not a successful papacy among the secular powers of Europe. When the attempt of papal forces to take over the ancient independent Republic of San Marino failed, Clement XII disavowed the arbitrary action of his legate, Cardinal Giulio Alberoni, in seizing San Marino, and restored its independence. He was also rebuffed in Papal claims over the Duchies of Parma and Piacenza. In August 1730 he gave permission for Victor Amadeus II of Savoy to carry out a morganatic marriage to Anna Canalis di Cumiana. Victor Amadeus II subsequently abdicated his throne causing great unrest in Savoy. In ecclesiastic affairs he issued In eminenti apostolatus, the first papal decree against the Freemasons on 28 April 1738. He canonized Saint Vincent de Paul and proceeded with vigour against the French Jansenists. He campaigned for the reunion of the Roman and Orthodox churches, received the Patriarch of the Coptic Church and persuaded the Armenian Patriarch to remove the anathema against the Council of Chalcedon and Pope Leo I (440–461). He dispatched Joseph Simeon Assemani to the East for the twofold purpose of continuing his search for manuscripts and presiding as legate over a national council of Maronites. He created the youngest Cardinal ever when on 19 December 1735, he named Luis Antonio Jaime de Borbón y Farnesio, Royal Infant of Spain, age 8, to the Sacred College. Though he was blind and compelled to keep to his bed, from which he gave audiences and transacted affairs of state, he surrounded himself with capable officials, many of them his Corsini relatives, but he did little for his family except to purchase and enlarge the palace built in Trastevere for the Riarii, and now known as the Palazzo Corsini (the seat of the Regia Accademia dei Lincei). In 1754, his nephew, Cardinal Neri Corsini, founded there the famous Corsini Library. 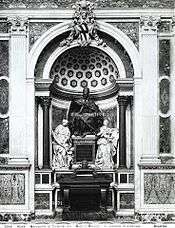 The tomb of Clement XII. Clement XII died on 6 February 1740 due to complications from gout. His remains were transferred to his tomb in the Basilica of St. John Lateran on 20 July 1742. Pope Clement XII's tomb is in the Capella Corsini of the Basilica of St. John Lateran and was completed by the sculptors Maini and Monaldi. His bust was completed by Filippo della Valle (see terracota bust.). Wikimedia Commons has media related to Clemens XII. This article incorporates text from a publication now in the public domain: Herbermann, Charles, ed. (1913). "Pope Clement XII". Catholic Encyclopedia. New York: Robert Appleton.